Aleph Objects’ LulzBot line of printers has always occupied the prosumer sphere, balancing effortless usability with hardworking dependability. Not without good reason is the LulzBot Taz 6 our awarded Workhorse 3D printer of spring 2019. 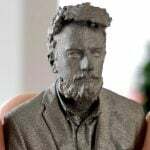 Likewise, the LulzBot Mini 2 is an enduringly popular machine in the All3DP office, with an Editor’s Choice award to its name. In short; they make excellent 3D printers. In the past these machines have mainly been pitched at prosumers, toeing the line between consumer price points and professional applications. One could argue, however, that as these machines have matured, so too have the users, the materials available to them, and the expectancy. And thus, a tool such as the LulzBot TAZ Pro is born. 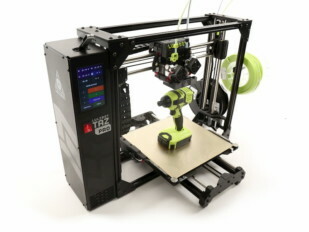 Revealed at the end of March 2019, the Taz Pro is LulzBot’s “first-ever industrial desktop 3D printer”. Boasting a larger print volume than previous LulzBot machines and a new custom dual print head featuring E3D hardware, it’s undoubtedly a wicked proposition entering a new higher-than-high-end segment for the company. Read on as we break down what exactly the LulzBot TAZ Pro is and what it can do. 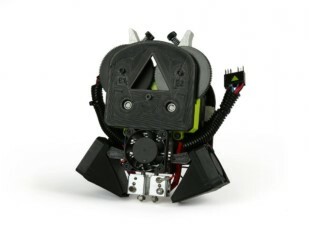 To the nekked eye, the LulzBot TAZ Pro shares many similarities with the Taz 6 3D printer. Here you have a sizeable PEI-coated print bed traveling in the Y-axis, with belt-driven X- and Z- axes, all housed within an open beam frame with left-mounted electronics and control box. In functionality, much of the LulzBot TAZ Pro is familiar too. The company’s distinctive pre-flight routine of nozzle cleaning and fully automatic bed leveling returns, enhanced further for the Pro with automatic X/Y/Z-axis offset calibration. Launching at $4,950 — almost double the price of its predecessor, the Taz 6 — the Taz Pro appears to be quite an evolution that improves on the company’s past machines. Indeed distinguishing the Taz Pro from the other LulzBot printers are the upgrade from an LCD/scroll wheel interface to a 5-inch color touchscreen and, as mentioned above, a larger build volume. Here the Pro offers an additional 35 mm in the Z-axis, bringing the total capacity to 280 x 280 x 285 mm. Not forgetting the Taz Pro Dual Extruder print head, perhaps the main talking point of the Taz Pro. Developed to offer accurate and reliable prints combining multiple materials, the Taz Pro is aimed to be used in the professional environment to create large functional prototypes, manufacturing aids and print-on-demand parts. To help the Pro achieve this, LulzBot uses E3D’s versatile Titan Aero extruder in a dual configuration. Outfitted with 0.5mm steel nozzles, for increased resistance to wear from abrasive materials, these dual hotend/extruders are mechanically lifted by linear actuators when idle, providing the clearance necessary for clean, contamination-free printing. By nature of the Titan Aero’s broad material compatibility, the Taz Pro is outfitted to handle a vast array of filaments, from flexibles to carbon fiber blends. Aiding further in providing accurate dual prints is the addition of 360-degree part cooling, which should ensure stable and consistent printing performance. Other tweaks and improvements to help elevate the Taz Pro’s usability in this desktop-industrial space include backlash compensation in all axes, a new Z-axis belt drive that promises faster cycle times (presumably through quicker layer changes and homing), dual filament runout sensors and, available separately from June, an enclosure with HEPA filter. LulzBot also offers a separate dual extrusion tool head for its printers in case you’re not ready to upgrade to a dual extruder printer yet. The latest v3 version is lightweight, small and better than its predecessors. It comes fully assembled and ready to double your fun. But, if you are in the market for the LulzBot TAZ Pro, it’s no stretch to imagine that it’s the company’s definitive new solution for multi-material printing within its ecosystem. Whether the near-doubling in price is justified, we’ve yet to see and look forward to finding out first hand when we try the printer for ourselves. 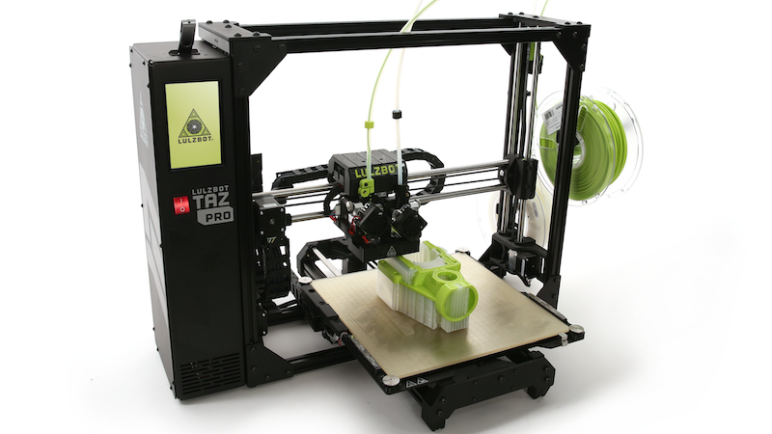 Pre-orders are currently available for the LulzBot TAZ Pro, with shipping expected to begin in April. 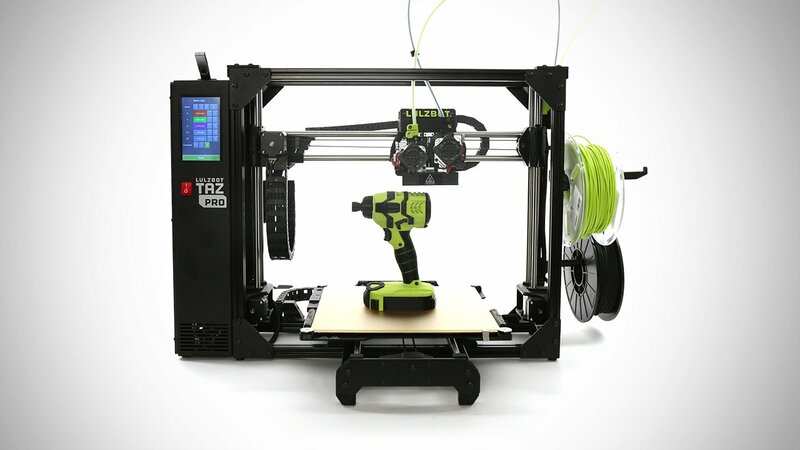 License: The text of "2019 LulzBot TAZ Pro 3D Printer – Review the Specs" by All3DP is licensed under a Creative Commons Attribution 4.0 International License.